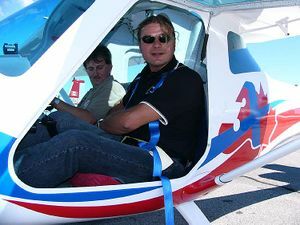 The 3X55 Trener (Trainer) and 3X47 Ultra are a family of ultralight civil aircraft produced in Poland by the 3Xtrim Aircraft Factory. Both are two-seat, high-wing, strut-braced monoplanes with fixed tricycle undercarriage and available only as completed aircraft. There are also 450 Ultra and 495 Ultra Plus sub-variants of the 3X47 Ultra, with gross weights adjusted for national ultralight regulations. 3Xtrim take their company name from a double entendre, as they refer to their designs being "triple trimmed" (or more exactly “triple-tested”) during the design, prototype and production stages and also that the aircraft is designed for “extreme conditions”. In English the company name is pronounced “Three-Extreme”. The 3X55 first flew in 1996 and by the summer of 2006 about 60 aircraft of both types had been produced. The fuselage and vertical tail of the 3X55 is a one-piece structure made from fibreglass. The firewall is a Fiberfrax ceramic/aluminium sandwich. The cockpit is 47.5 inches wide at the elbows. Crew access is via a door on each side of the cockpit that hinges upwards and is supported by a gas strut. The wings are strut-braced with a single spar and are made from fibreglass and foam with a 15.5% CAGI.R3 airfoil. The wing has a span of 31 .5 feet and an area of 127.4 sq ft, which gives it a wing loading of 9.5 lbs/sq ft at gross weight. 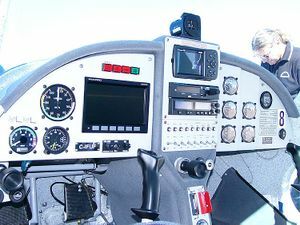 The aircraft has removable wings, with single locking pins and quick-disconnect controls which can be easily hooked up and inspected from inside the cockpit. The wings have conventional frieze ailerons and slotted flaps. The elevator and rudder are also conventional. Ailerons and elevator are controlled by dual centre-mounted sticks through push-pull tubes, while the rudder is controlled by cables. The rudder cables attach to the rudder by wrapping around the wide bottom diameter of the rudder itself. The pitot tube is mounted in the left-hand strut. 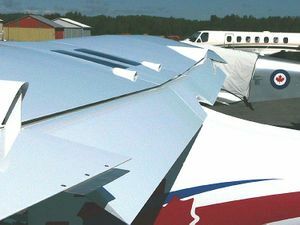 The plane comes in one colour – white, but owners can add their own vinyl decals to finish the plane as desired. The fuel tank is located behind the right-hand seat. The quantity can be read directly through a sight gauge behind the seat. The standard tank is 70 litres (18 US gallons) with 87 litres (23 US gallons) optional. Behind the left-hand seat is a small baggage compartment, with additional baggage space above and behind both seats. 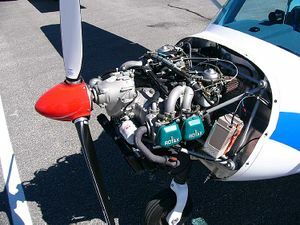 The 3X55 powerplant options are the 80 hp Rotax 912UL or the 100 hp 912ULS. The standard fuel is premium auto fuel, but it can run on 100LL as well. 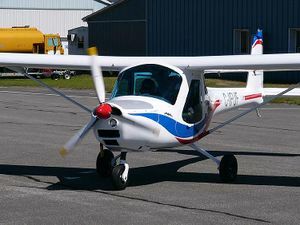 The 3X55 can be equipped with either a three-bladed, fixed pitch Czech-made Woodcomp wood/fibreglass SR 200 propeller or an electrically adjustable Woodcomp SR 2000 propeller, with an optional constant speed unit. The main landing gear consists of sprung fibreglass gear legs with 5X5.00 tires as standard on graphite wheel rims. Larger 6X6.00 tires are optional. The nose gear is a single-fork design also made from fibreglass. Nose gear suspension is a compressed rubber donut system. This page was last edited on 24 December 2007, at 14:15.